The first time I made cupcakes like these was for a wedding. It's the one and only wedding I've ever made cake/cupcakes for. It's too stressful for me. 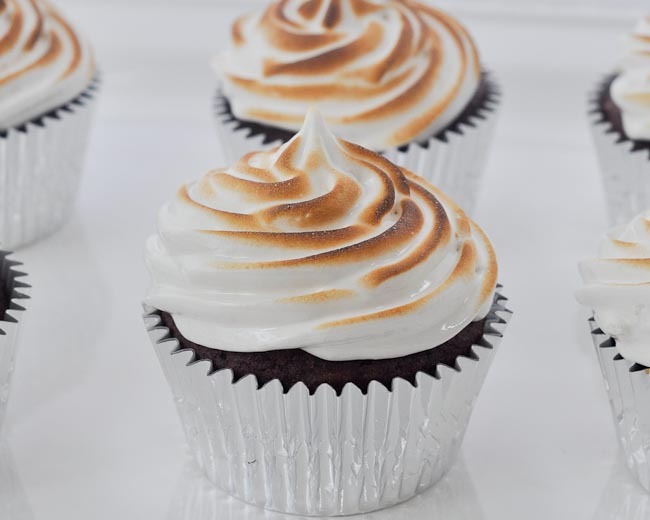 But these cupcakes are so, so yummy. Not stressful at all. *Note: You could also use a doctored chocolate cake mix if you want to save a step. 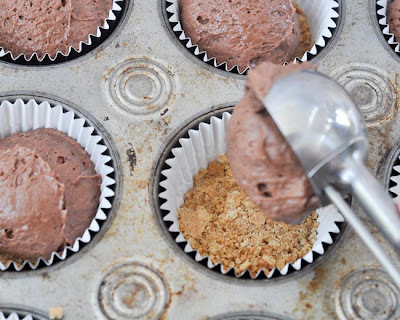 Preheat the oven to 350-degrees (F), and prepare cupcake pan(s) with liners for 2 dozen cupcakes. ** You may want to use "greaseproof" or the sliver liners so that you can't see the grease from the crust." 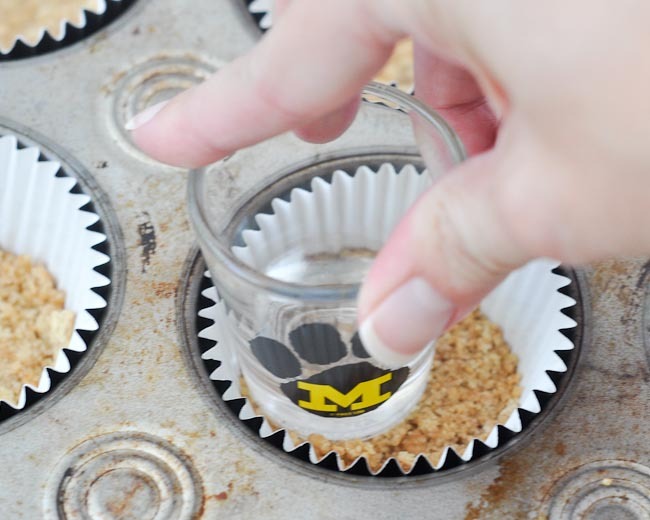 Make the graham cracker crust. Scoop about 1 Tbsp. into each cupcake. Using a small glass (I've found a Mizzou shot glass to work best- but any shot glass would probably work), compact the crumbs into a crust. Scoop a scant 1/4 cup of chocolate cake batter into the cupcake liners over the crust. Remember that the crust takes up a little extra space, so use a little less batter than you usually do. Bake at 350-degrees for 15-18 minutes. Remove from the oven to cool on a cooling grid. When the cupcakes are cool, use a pastry tip (I used #1M here), to pipe the marshmallow icing on top of the cupcakes. 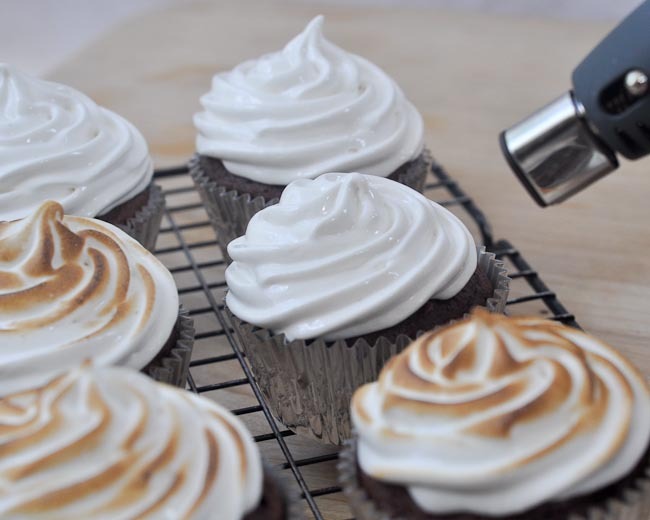 Use a kitchen torch or the broiler to toast the tops of the icing. *Note #1: You can see that the icing was a little soupy. That's because I let it sit for a few hours before piping it. Don't do that. Whip the icing shortly before you pipe it. ***Note #3: Click the link to see my tutorial on making a cupcake swirl. You can either serve the cupcakes like this. I think they look elegant. 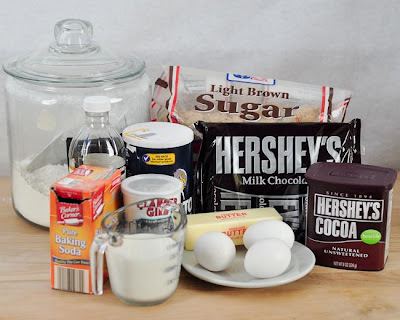 Or you can add the Hershey's and graham crackers. 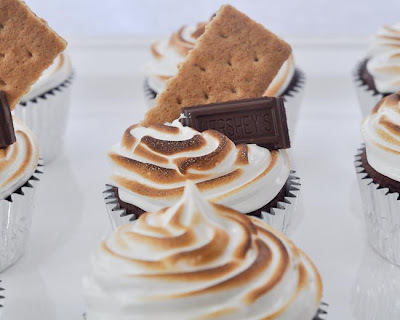 One note about the graham crackers, they will get mushy after a few hours, so don't add them if you're not serving the cupcakes right away-- or just warn people. I want to make these cupcakes for a family party but I have a few questions. Will the frosting hold up ok if they travel in a car for 4 hours? Can I make the frosting the night before I frost the cupcakes? 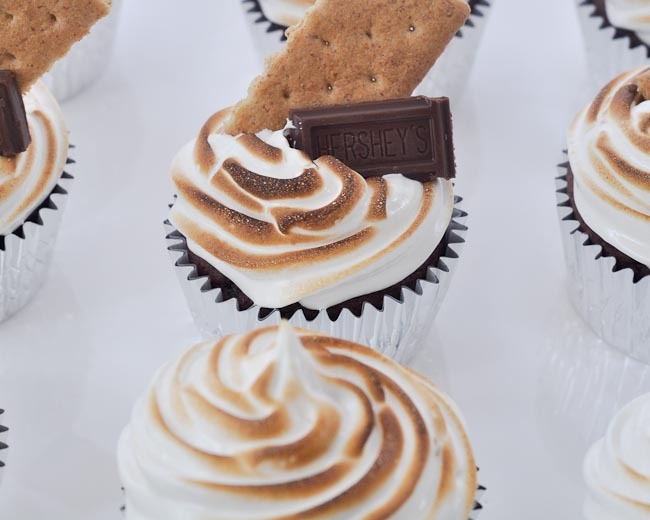 What is the best way to store these cupcakes for the weekend?